Atty. 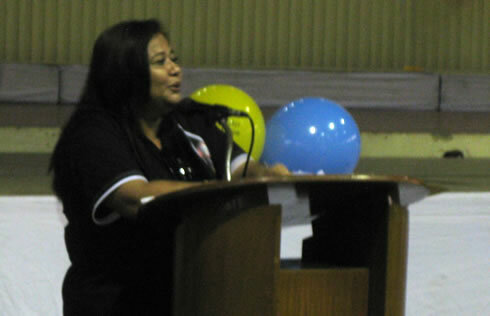 Tillah-Alasco talks to some 700 faculty members of the university during the fete. The WMSU Faculty Union, headed by its president Atty. Grace C. Tillah-Alasco and the rest of the Faculty Union Board Officers, commemorated its 10th Anniversary as a duly authorized Union last September 16, 2011. The whole day affair featured words of welcome from Dr. Samuel R. Calisang, Vice-President of the Faculty Union, Business Meeting/President’s Report and Team Building Games. The event also was a welcome reprieve for the tired faculty members. After spending years being recognized as a mere Faculty Club/Organization, R.A. 8292 declared that the president of the Faculty Club of a State University or College shall be a member of its Board of Regents/Trustees. This prompted the Faculty Club to register as a Labor Union. As attested to by Certificate of Registration No. 945 presented by the Department of Labor and Employment (DOLE) and the Civil Service Commission (CSC) registering the WMSU Faculty Union, pursuant to the provisions of Executive Order No. 180 and the Implementing Rules and Regulations Governing the Exercise of the Right of Government Employees to Self-Organization, as a duly recognized Public Service Labor Union in 2001.